All cautions and requirements recommended by L&L Kiln Mfg. Inc. are meant to assist Users to properly and safely operate their kilns. Many of these cautions apply to kilns and ceramic processes in general. By making use of, and/or downloading from, this web site, User acknowledges that process and manufacturing systems improperly installed, maintained, or operated can pose serious and dangerous threats to worker safety, environmental integrity, and product/process quality. Kilns operate at high temperatures and make us of high voltages/amperages and if improperly installed, maintained, or used can cause serious personal or property damages. Commercial kilns are provided with various safety, performance, and operating limits, designs and devices which, if disconnected, altered, tampered with, or changed by User, User's employees, User's agents, or others acting on User's behalf or with User's knowledge, will become User's sole risk and responsibility. User also has the sole responsibility for assigning properly trained persons to operate the kilns who have demonstrated common sense and a general aptitude for such work. It is User’s sole responsibility to understand and assure adherence to all safety notices and installation, operating, and maintenance instructions provided by this web site and/or by the kiln manufacturer. Electricity is a wonderful utility, but can be dangerous if not approached carefully. There are three basic hazards that cause injury or death – shock, arc-flash, and arc-blast. It is important to remember that even a small amount of current passing through the chest can cause death. Most deaths occurring for circuits of less than 600 volts happen when people are working on “hot,” energized equipment – PLEASE DISCONNECT AND LOCK OUT ALL ELECTRICAL POWER BEFORE ATTEMPTING KILN REPAIRS! An electrical shock is a current that passes through the human body. Any electrical current flows through the path of least resistance towards ground; if an external voltage contacts a human body, e.g. by touching a live wire with the hand, the voltage will try to find a ground, and a current will develop that flows through the body’s nervous system or vascular system, and exit through the closest part of the body to ground (e.g., the other hand which may be touching a metal pipe.) Nerve shock disrupts the body’s normal electrical functions, and can stop the heart or the lungs, or both, causing severe injury or death. An arc-flash is an extremely high temperature conductive mixture of plasma and gases, which causes very serious burns when it comes into contact with the body, and can ignite flammable clothing. Arc temperatures reach up to 35,000°F – which is 4X the temperature of the sun’s surface! Arc-blast is a pressure wave resulting from arcing, which can carry molten metal fragments and plasma gasses at very high speeds and distances. This can not only carry very hot shrapnel to injure a person, but can actually be strong enough to destroy structures or knock workers off ladders. Be safe! Make sure any equipment that is being installed or serviced is disconnected from all sources of power. In industry, it is important to have ‘Lockout and tagout’ procedures in place to make sure that power stays disconnected while people are servicing equipment. It is just as important in residential and commercial sites – DO NOT WORK ON LIVE EQUIPMENT UNLESS ABSOLUTELY NECESSARY! Use the right tools for the job – do not improvise. For instance, use a proper fuse puller; don’t use a screwdriver to pry out that open fuse. Protect the person; use proper gloves, shoes, and clothing. In industry it is recommended to wear safety goggles or face shields to prevent arc-flash or arc-blast injuries. Wear rubber soled shoes. Make sure the environment around the equipment being serviced is safe. For instance, when working around electricity, it always very dangerous for the floor to be wet. Make sure there is adequate space to work safely. Be aware that current flow across your chest can be fatal. If possible, use only one hand to manipulate test leads when conducting any necessary measurements on live equipment. Use a clamp for one lead, and use one hand to guide the other test lead. Keep the other hand as far as possible from the live circuit components. Have electrical installation performed by an licensed electrician or other qualified technician. There is danger of electric shock. There is danger that an improperly sized or installed circuit could cause a fire. Make certain floor is not flammable. Install kiln so that the hot surface of the kiln is no closer than 12" (30 cm) to any wall. 18" (46 cm) is preferable. Be careful about enclosed spaces: In general, it is not a good idea to install a kiln in a small confined space (such as a closet). Maintain a minimum of 36" (91 cm) between the hot surfaces of two adjacent kilns, especially if they are going to be used at the same time. (The kilns will heat each other). The essential issue with kiln clearance is to keep excessive heat from flammable surfaces. Remember, even when you follow clearance and ventilation recommendations, the kiln is giving off heat. Try not to locate it near things that can be affected by elevated temperatures. An example of this would be an electrical fuse panel which you do not want to overheat. Check temperatures around the kiln when it is at high fire to be sure that you are not creating an unsafe condition. Combustible surfaces that stay below 71°C (160°F) are generally considered safe from the point of view of starting a fire. Level the kiln while you are installing it. Use thin metal shims under the legs to accomplish the leveling (never wood or other combustible materials). Make sure that the base will not wobble. Leveling is important because the kiln sitter (in manual kilns) is affected by gravity. If the kiln is not properly leveled the kiln sitter might be either too reactive or too sluggish. You do not want your ware to be unstable in the kiln. If kiln is not leveled this could lead to the cracking of the bottom and the top. In particular, the bottom could easily crack when you first set the weight of the kiln on the bottom while setting up the kiln for the first time. See the assembly instructions for your particular kiln. The hinge of any kiln must be adjusted so that the expansion caused by the heating process has room to expand. 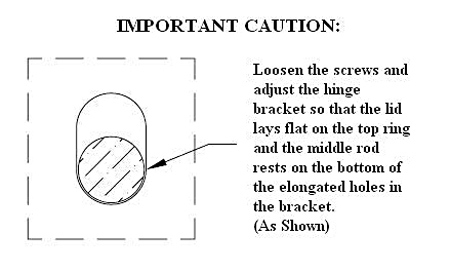 An improperly adjusted hinge can damage the rim and/or lid but also makes the brick of the rim compress against the brick of the lid. CAUTION: Do NOT attempt to disengage the spring hinge without first reading the detailed assembly instructions. The spring is under great pressure and could cause severe injury if it is removed under pressure. RELIEVE ALL SPRING TENSION BEFORE REMOVING! CAUTION: It is critical that the hinge bar sits in the bottom of the slot. This is to allow the lid to rise and lower slightly as the kiln heats and expands with out putting stress on the lids connection points and potentially damaging the lid. Thermocouples (in automatic kilns) must be inserted into the kiln at least 1" (2.5 cm) in from the inside surface of the kiln. They must protrude into the kiln itself because if the measuring tip of the thermocouple is buried inside the insulation the thermocouple will measure a lower temperature than the actual temperature in the kiln. This could cause an overfire of the kiln. Replace thermocouples once they are no longer reasonably accurate. Do not use kiln without the supplied stand. Never set a kiln on a floor without significant air space circulating under the kiln. L&L stands typically raise the floor of the kiln by 8" (20 cm). See this link about installing kiln on a wood floor. Never use an extension cord with your kiln. Locate the outlet close enough to the kiln to plug directly into it with the kiln's supplied power cord. Kilns that pull over 48 amps and some three phase kilns generally will not have a power cord. These kilns need to be direct-wired to the power supply. All L&L power cords are rated for 105°C (221°F). Anything less than this can cause a malfunction and possible fire where the power leads connect to the control box. It is OK, and will not void the warranty, to remove the plug that comes with the kiln and direct wire the kiln. However, the connection wires must be rated for a minimum of 105°C (221°F). Do not use aluminum wire on the final connection to the kiln. The specific reason particular to kilns is that the wire tends to get hotter near the kiln than it might going into some other types of appliance. Being a resistive load, there is constant heat being generated by the conductors for quite a few hours. When aluminum wire gets hot it accelerates oxidation. Aluminum oxide is a resistor; copper oxide is not as much. If the connection at the terminal board gets oxidized it will really heat up - to the point where it could cause a fire. Note: Depending on local codes it may be OK to use aluminum wire to your sub-panel - as long as that wire is not exceeding its temperature rating while kiln is firing on full power for an extended period of time. Rout Power Cord (or electrical connection wires) away from kiln in such a way that it can not touch the hot case of the kiln. Secure it so it can not move. If cord touches the hot case it could melt and cause a short circuit and/or fire. The kiln must be kept dry. It is best to keep it in an enclosed room away from inclement weather. See specific details in the INSTALLATION INSTRUCTION section of your Instruction Manual or here in the Kiln Installation Checklist. Note that our warranty does not cover damage from corrosion and electrical damage caused by inclement weather. Water in contact with a kiln can cause an electrocution hazard. If you keep a kiln outside (even in a very dry environment) and cover it with a tarp to protect it from rain you could still cause corrosion from the dew that forms on the cold metal surface of the kiln in the morning. Keep an adequate fire extinguisher near the kiln and check it on a regular basis. You may want to check with your local fire authorities to see if there are any specific requirements they have such as sprinkler systems, automatic foam extinguishers, etc. Use a fire extinguisher that is rated for electrical fires (we recommend ABC rating). If you have a sprinkler system be careful to check the temperature rating and location of the heads so that you do not inadvertently cause them to actuate under normal firing conditions. Be sure to monitor this while the kiln is at its highest firing temperature and conditions are at their worse (for instance when the door to the kiln room is closed or the ventilation fan is turned off). Serious damage to the kiln and your premises can take place if the sprinkler system goes off when the kiln is at high temperature - especially if no one is in building when it happens. Put the highest temperature rated sprinkler head in the room or else make sure it is not right above the kiln. Don't locate a sprinkler head directly over a kiln. You could get localized heating just above the kiln when the door is opened or if say the kiln lid was slightly opened. You may want to look into an alarm that would alert the appropriate personnel if the room temperature got above say 125°F. The sprinkler may keep the building from burning down but the damage from the sprinkler itself can be catastrophic. Make sure you ventilation is adequate for the room. See this link to calculated ventilation requirements. Kilns generate harmful fumes when firing ceramics. Fumes include carbon monoxide, sulfur oxides, hydrogen fluoride and metal vapors (all of which can be very toxic). Install kiln in well-ventilated area. Never operate in an enclosed space such as a closet unless you have good ventilation. Aside from issues of ventilating the fumes from the firing, the heat build up in an enclosed room could present a significant fire hazard. See the INSTALLATION cautions. Severe corrosion can be caused by kiln fumes, salt air or other environmental conditions. Good venting can minimize these problems. Ventilation must be to the outside. Be careful not to locate the outlet of the vent near an open window (so that it could get sucked back into the building). What should I do to ventilate my kiln? See this for helpful tips on how to ventilate. See this for how to calculate ventilation requirements. If you are using a hood type vent (like the Vent-a-Kiln) do you need a kiln vent (like the Vent-Sure) also? The kiln should operate in an environment that is between -18°C (0°F ) and 38°C (100°F). Note that the control, if set up for degrees centigrade, may give you an error code if room temperature drops below 0°C (32°F). The DynaTrol and most other controls do not handle negative numbers. Kiln surface can be extremely hot: up to 260°C (500°F). You can be severely burned if you touch the hot surface. Display a sign near the kiln that specifically warns everyone of how hot the kiln is. Protect any children, animals, and unqualified adults (anyone who is not able to understand these cautions) that may be near the kiln. Aside from fumes that must be ventilated, and flammability concerns, they must be protected from the heat of the kiln and the electrical dangers. Ideally, the kiln should be secured in a space away from any children (especially in a schoolroom situation where children might not always follow safety precautions). Do not put sealed containers or combustible materials such as solvents, paper, rags, in or near kiln. The kiln elements, when hot, could act as ignitor of flammable fumes. An explosion or fire could result. Clay contains silica dust which can be harmful (see silica caution) and that many glazes contain heavy metals such as lead, cadmium and copper. While this caution is outside the scope of kiln safety it is worth mentioning here. Keep your room clean and your kiln clean. Be sure to remove tripping hazards near the kiln. In particular be sure to keep the kiln cord out of traffic areas. When working around a hot kiln be careful of the kinds of clothes you are wearing. Some clothes could potentially catch on fire if they touch the hot surface of a kiln. Also avoid loose fitting clothes that could catch on the kiln. Make sure the floor of the kiln and the tops of the shelves are coated with kiln wash. This will protect these surfaces from melting glaze and ceramics. Do not coat the undersides or sides of the shelves. Do not apply kiln wash to the brick sides or element holders. (Damage to the elements could result). If you have a kiln sitter, put kiln wash on the cone supports (not the sensing rod) for accurate cone action. Clean off the old wash and reapply new wash each time you fire or when it begins to chip away. Long term exposure to silica dust could cause lung damage. Exercise proper caution when mixing the dry powder and when removing it from your shelves. Use a NIOSH approved particulate respirator for dust and use proper ventilation. You can buy these from safety supply houses. (NIOSH_approval #TC-21C-132 is an example). Do not use silica sand in the kiln. Some people like to use this as a work support medium. The silica sand will attack the elements and thermocouples. It can migrate in the kiln from expansion and movement due to heat. If you must use sand to support or stabilize your load try alumina oxide or zirconia oxide sand. Never load moist greenware or pots in your kiln. The expanding water vapor in the ware could cause the ware to explode, damaging your kiln interior. We recommend using a dry out segment in your bisque program at 66°C (150°F). (Note that, because of the thermocouple offset programmed into our DynaTrol when we use the ceramic protection tubes, the display temperature will read 93°C (200°F) when the real temperature is 66°C (150°F)). Remember that there may be water trapped in the work even if you can't always see it. If you place a piece of greenware next to your wrist and it feels cool to the touch it probably has too much moisture in it to fire. When you heat wax (in wax resist and lost wax processes) it will volatilize and potentially condense in the cooler ventilation ducts. Over time this can cause a fire hazard because the wax is flammable. Depending on how the vent motor is mounted, the wax can also gum up the vent motor. If you use these processes it is entirely up to you to engineer and monitor the safety of the installation. The use of wax will void the warranty of the vent system. Tempered glass can explode when fired. This can cause them to explode when fired. Cracked shelves can fail in the middle of a firing causing the whole load in your kiln to collapse. Plastics, organic materials, bakeable modeling clay, mothballs and a large variety of materials can decompose under heat causing the release of highly toxic fumes or rapid uncontrollable combustion. Rocks, marbles, cement and other materials may explode under high temperatures. Before firing anything but ceramics, glass and metal (obtained from a known reputable source) in a kiln carefully investigate what happens under heat. This is the sole responsibility of the user. The kiln is not designed to be used for firing hazardous materials. Adding propane, wood, charcoal or other materials intended to produce a reduction atmosphere can be hazardous if the volume is sufficient. Note that these materials can cause an explosion under certain conditions (just the right amount of air and flammable gasses at just the right temperature) which could cause injury or death. Moreover, a reducing atmosphere can cause premature element failure by reducing the protective oxide coating on the elements. Also note that carbonaceous materials will produce poisonous carbon monoxide and highly flammable hydrogen as they decompose at high temperatures. Also note that the "auto-ignition" temperature of flammable gasses is generally above 1400° F.
Be sure to LOCK THE LID IN PLACE with the safety hooks when in the up position. There is one on each side of a DaVinci kiln. Use both chains. Turn off power to the kiln when loading or servicing. If power is on when you are loading or unloading the kiln it is possible to touch the elements and get electrocuted. We recommend having the kiln attached to a fused disconnect switch with a lockout device (in any institutional or industrial installations where someone could turn on the kiln while someone else was working on it). Keep lid closed when not operating the kiln. Otherwise the weight of the lid over time may force the hinge and stainless wrap to move down. This will affect the way the lid closes and may cause the lid to crack. It will also keep the kiln cleaner by keeping dust out. In addition, if the kiln somehow gets turned on accidentally, an open kiln could present a fire hazard. Do not use the lid as a storage shelf. Also - this practice could lead to a fire if you accidentally leave combustible materials on the lid. Do not open the kiln door until the kiln has cooled down to 250°F (120°C). You could burn your hand on the handle and/or the radiant heat from the kiln. Be careful when you do open the door at this temperature because you can still get burned. Use heat resistant gloves when opening the door. (These are available from L&L). For ventilation purposes, some people fire with the lid slightly propped open 1” to 3” during the beginning phase of the firing (if they do not have a downdraft vent system). Be aware of the potential dangers of doing this (heat, live electricity, fumes and potentially cracking the lid) and take appropriate measures to protect yourself and the kiln. Stilt marks and other sharp protrusions can cut you. Remember that that glaze is like glass. Wear safety glasses while grinding or knocking of stilt marks. Check the shelves for broken bits of glaze which may have attached to the shelves. These can be like shards of glass that can cause a serious cut. Be sure to LOCK THE LID IN PLACE with the spring-loaded plunger pin located on the side of the hinge. A special safety system is supplied with your Liberty-Belle, E18S, E18T, D18S, D18T, J18, or J18X kiln. This is a door safety chain. It secures the lid in an open position when you are loading or unloading the kiln and insures that the lid can not accidentally come down on you.You must install and use this for your safety's sake. This drawing shows the safety chain installation and use for the standard older Jupiter hinges. Use dark glasses (shade number 1.7 to 3.0) to view inside the kiln through the peepholes when firing. (These are available from L&L). These will protect you from the radiant infrared radiation and will also protect your eyes in case the ceramic ware explodes. Do not use regular sunglasses for this - they are not designed to protect your eyes from this type of radiation. Use heat resistant gloves when opening peephole plugs. They are very hot and can burn you. Do not open the kiln lid unless the kiln is turned off (except for carefully controlled troubleshooting tests). There is danger from electrocution. Cracks caused by propping open the lid are not covered by the warranty. Use heat resistant gloves when opening a hot lid. 5) Do not open the lid when the kiln is above 121°C (250°F). We recommend attending the kiln while firing. NO AUTOMATIC SAFETY DEVICE IS FOOLPROOF! BE ESPECIALLY CAREFUL ABOUT ATTENDING THE KILN WHILE IT IS SUPPOSED TO SHUT OFF. (The Delay feature in automatic kilns gives you control over this). If you have a manual kiln with a Kiln Sitter PLEASE BE EXTRA CAREFUL! Kiln sitters can be very unreliable because of the moving parts, dirt or clay that can get into the tube, the way cones are placed on the tube, corrosion, etc. DO NOT FIRE THIS KILN UNATTENDED WHEN THE KILN IS SUPPOSED TO TURN OFF AND LEARN HOW TO USE THE TIMER BACK UP. Neither L&L Kiln Mfg., Inc. nor Edward Orton Jr. Ceramic Foundation warranty the kiln or kiln sitter against damage caused by overfiring. ALMOST ALL OVERFIRED KILNS WE SEE ARE FROM A MALFUNCTION OF A KILN SITTER. We highly recommend firing all manual kilns with witness cones that you can see through the peephole and/or a pyrometer so you have some idea of what is happening inside the kiln. The controller is used to control temperature; it is not a safety device. Become familiar with either the control (if you have an automatic kiln) or the Kiln Sitter (if you have a manual control or have that as your backup control). Do this before operating the kiln. Review the current program before firing to ensure the correct profile is programmed. You may pick up an important mistake and save a whole load. Hit Review Prog after you have done your programming and the control display will scroll through the program. It only takes a minute or less. Cone ratings are not intuitive. Cones with an "0" in front of them (like cone 05) are lower in temperature rating and the higher the number the lower the temperature rating. On the other hand cones with no "0" in front (like Cone 5) raise in temperature as the number gets higher. For instance, Cone 05 is a much lower temperature than Cone 5 for instance. If you fire Cone 05 clay to Cone 5 you could cause a serious overfiring of the material which could melt in your kiln and cause severe damage to the kiln interior. See the Orton cone chart. Thermocouples will drift in reading over time. This could potentially lead to an overfiring before the thermocouple actually fails. Although you can not easily check thermocouple calibration, the general accuracy of the entire kiln system can be checked by firing with witness cones. See this link about calibrating your kiln. It is important to remember that thermocouples do not measure heat-work (which is all that matters in ceramics). You must calibrate your kiln control to match the performance of a cone to get the most accurate representation of the process. Never use a different type of thermocouple with your controller unless it has been set up from the factory. For instance if you used a Type S thermocouple on a control set up for Type K you would overfire your kiln. On some controls (like the newer DynaTrols) it is possible to change thermocouple types. However, this involves both a programming change and a jumper change on the control. It also requires you to change out all the thermocouple lead wire to properly calibrated wire for the new thermocouple type. See this link for more information on thermocouple polarity and extension wire hookup. Most L&L kilns are rated for use to 2350°F (1290°C, Cone 10). The rating of the kiln is listed on its data nameplate normally affixed to the control panel. DO NOT FIRE ANY HIGHER THAN THIS or hold for extended periods of time at those temperatures. The elements, element holders and firebrick could melt. It is possible for electrical contacts on contactor relays to fuse together. If this happens power will continue to flow to the elements and your kilns could overfire even though everything on the kiln is shut off. You should turn kiln off from the circuit breaker or fused disconnect switch after turning off the kiln itself. If you have a manual kiln (or the Kiln Sitter backup on an automatic kiln) be sure it is properly adjusted. See the Kiln Sitter instructions. Note that the kiln sitter could have gone out of adjustment during shipment. Do NOT assume that it is adjusted when first firing the kiln. The tube assembly should be replaced if gets overly corroded or contaminated with condensed glaze or other materials. Dawson recommended checking the pivot point for corrosion and sluggishness every 6 to 12 months. If you have a kiln sitter, put kiln wash on the cone support (but not the sensing rod) for accurate cone action. This will keep the cones from sticking when they bend. We recommend cleaning off the old wash and reapply new wash each time you fire. Check element holders and walls for glaze, clay chips or anything that could melt at a high temperature. If melted clay or glaze comes in contact with an element, a rapid failure could result. The molten material traps the heat radiating from the element and subsequently raises the surface temperature of the wire. The temperature will quickly pass the maximum recommended temperature for the wire and burn it through it. To clean holders, a good shop vacuum will handle dust and loose crumbs. A very gentle chisel or grinder may help with glaze contamination on element holders, but remember that the elements themselves are quite brittle when they are cool. Replace the contaminated holder if you can not clean it. Remove any glaze that has splattered on the firebrick or shelves. (USE SAFETY GLASSES WHEN DOING THIS BECAUSE GLAZE CAN BE LIKE BROKEN GLASS). Vacuum afterward. Note about vacuuming: it is possible to build up a strong static electricity charge when you are vacuuming. If this somehow manages to discharge into the control it can ruin the electronic circuit. Make sure vacuum is grounded and periodically touch some grounded metal surface away from the kiln to discharge the energy. Shut off kiln when servicing it unless you are doing a live test that specifically calls for power. If you are in an institutional or commercial setting use a lock out/tag out procedure. Unplug if the kiln includes a plug; if not then turn off at the closest circuit breaker or fused disconnect. When testing ohms for an element circuit you do not need the kiln powered. The elements carry high voltage and can electrocute you. Many of the tests described in the troubleshooting manual are performed under power. They should be done ONLY by someone who is familiar with electrical safety such as an electrician or trained maintenance person. As long as the kiln is unplugged or turned off at the fused disconnect switch or circuit breaker (and checked with a reliable meter to be sure) you are safe. Check wires for deterioration or oxidation. Replace any that seem brittle or where the wire insulation has deteriorated or fallen off. Check terminals for oxidation (discoloration). If you are near salt air or if you notice corrosion on the stainless exterior of the kiln for whatever reason (like certain fumes generated by your work) then do this far more frequently. Check power connection terminals in the kiln and control box for tightness. Be sure to do this with the power disconnected (unplugged) for the kiln. If these terminal connections get loose heat can be generated (because the electrical resistance gets greater) and this can cause a fire. Check thermocouple connections for corrosion, tightness and oxidation as well. A bad thermocouple connection can change the accuracy of the temperature reading which could cause an overfiring. Occasionally check temperatures of the main power cord at the main receptacle and the main kiln breaker while the kiln is at its hottest. If these are hotter than normal, it could be a sign of a loose or corroded connection, or possibly the wire gauge used in the power hook-up is the wrong size for the amount of current being drawn by the kiln. Immediately diagnose and fix this because it could cause a fire. Also check temperature of any other cords on the kilns (such as element jumper cords). When replacing infinite zone switches (and other electrical components), replace the electrical connectors. At the very least check for discoloration (an indication of oxidation). Electrical connectors will typically oxidize over time where there is heat and this can cause further overheating of the part at the connection point. This can in turn lead to early failure of the part, wire and connector. Make certain that the new connectors are firmly crimped onto the wire. Non-L&L elements can present a potential hazard to the kiln or cause a fire (by drawing too much amperage). The wrong type of fuse, relay, switch or other component can cause a fire or other hazardous condition. An improperly rated cord can cause a fire. We do not recommend any coatings for the elements. Use of ceramic coatings will void the warranty on the elements and potentially the firebrick or element holders if it contaminates them. We have not adequately tested these coatings so we can only say, at this time, that any trouble that results from the use of ITC and other coatings must be at the risk of the user. We do use a proprietary coating on all our firebrick that improves firebrick life and reduces dusting. All customer modification is made solely at the risk of the customer. Modifications will void the warranty. L&L takes no responsibility for hazardous conditions created by unauthorized modifications. Any authorization for an engineering change must be in writing from the factory. You may add insulation to the bottom, and to some extent the top. If you put too much insulation on a lid it may weaken because it relies on the cooling of the lid to maintain its structural strength. This could lead to cracking or potentially a collapse of the lid. See the various troubleshooting guides for information about this. However, never wrap insulation around the perimeter of a typical sectional kiln. You could trap heat in the wiring boxes and cause an electrical fire. Also the stainless steel wrap that hold the kiln together will expand and loosen the structure of the kiln. Kilns are amazing appliances. However, unlike ovens that you might compare them to, they have inherent dangers that you and anyone who works around the kiln need to be aware of. Kiln can reach 2350°F inside which is hot enough to melt many metals. The outside is not only hot but it gives off a lot of heat. The electric power flowing through the elements is enough to electrocute you. Some of the ceramic materials that are typically fired in a kiln can have hazardous fumes. Yet with all of this the many thousands of kilns in operation have a fantastic safety record. Still - the best safety device is an educated user. Please read through these cautions - you will learn things you may not have thought of before. And keep in mind this is a living document - we are constantly adding to it. Click here to download a PDF of these Cautions.